This recipe doesn't really scream "try me if this is your first time cooking!" There is no recipe here that gives the step-by-step directions on the macaroni and cheese. We had a leftover pan at school and I wanted to do something fun with it because we couldn't really serve it again. You can season the breadcrumbs however you'd like, but I love the flavors of Ranch and macaroni and cheese, they work really well together. I also used our homemade ranch seasoning that we make in-house, but you can use the packets, or use your own seasonings! Lastly, the measurements for this recipe will vary depending on the amount of leftover macaroni you have - so don't be afraid to add or subtract for what looks good with what you're working with. Also, if you want to add some extra flavor to the mac and cheese itself, wrap those babies in bacon strips before dredging them! Enjoy! 1. Prep your dredging station first. Whisk together the flour, cayenne pepper, salt and pepper. Additionally, whisk the eggs and buttermilk together, and then the panko breadcrumb and the Ranch seasoning. In three different mixing bowls, set up the flour, then the egg mixture, and finally, the breadcrumb. 2. 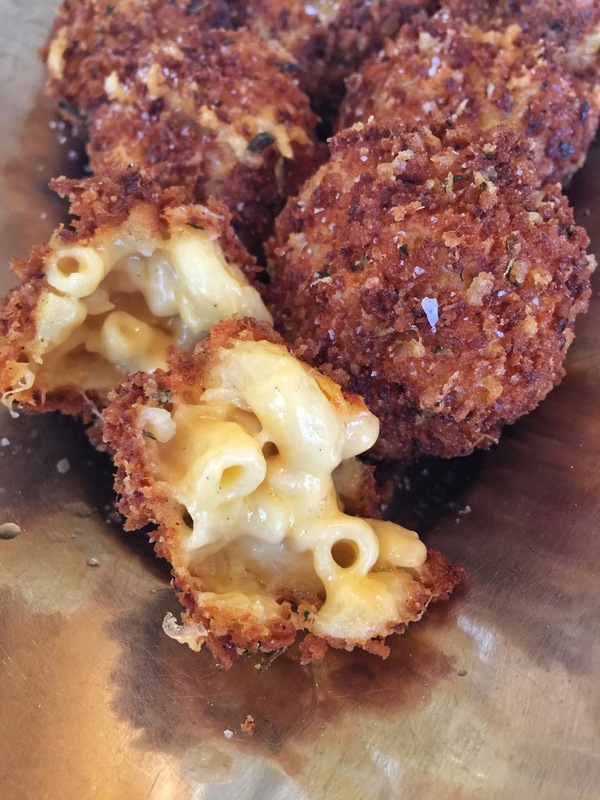 Using a larger melon-baller or a small ice cream scoop, form small balls with the cold macaroni and cheese. Roll the bites around in the flour, then coat with egg, and dredge in the breadcrumb. Squeeze balls with the breadcrumb on there to secure it is coated evenly all the way around. 3. 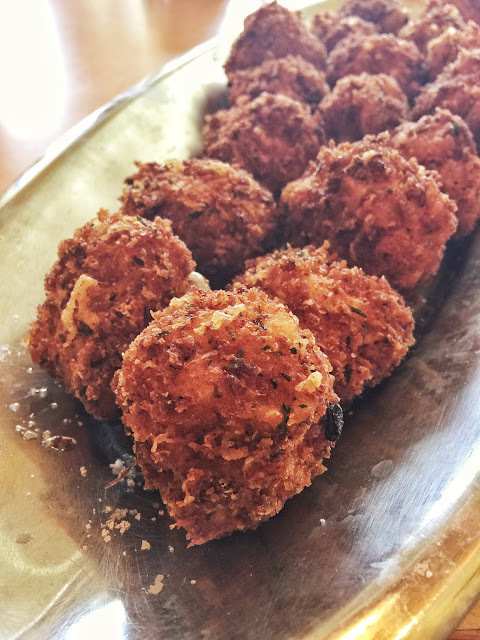 In a deep fryer, (or a pot with vegetable oil heated to 350-degrees), drop macaroni and cheese bites in a few at a time. Fry until golden brown on the outside, and gooey and hot on the inside, roughly 4-5 minutes. Repeat until all bites are done. Sprinkle with sea salt and serve with your favorite dipping sauce: marinara or ranch dressing are my favorites!